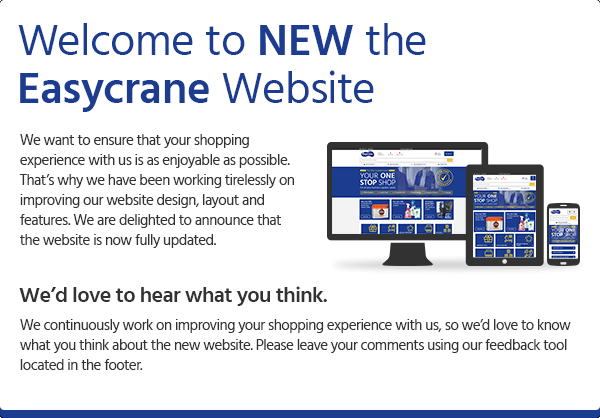 “Easycrane Ltd"(“we”) is a company registered in England (Company No. 04612434; VAT No. 805 415 943) and our registered office is at Unit 23, The IO Centre, Armstrong House, Royal Arsenal, London, SE18 6RS. 3.3 In consideration of agreeing to your use of the Website, you acknowledge that the ownership in any intellectual property rights (including for the avoidance of doubt, copyright, database rights and trade marks) in the Website belongs to us or is licensed to us. Accordingly, no part of the Website (or its source code) may be used, transferred, copied or reproduced in whole or in part in any manner other than for the purposes of utilising the Website for the purpose set out in these Terms and Conditions. You may not use any method of systematic retrieval of content from this Website to create or compile, directly or indirectly, a collection, compilation, database or directory (whether through robots, spiders, automatic devices or manual process) without written permission from us. 4.1 You may register with us and create an account by clicking on the login/register link . You are asked to confirm at that stage whether you are purchasing as an individual in your own personal capacity or whether you are purchasing as a business. Whichever option you choose you warrant to us that it is true and accurate. 4.2 You are solely responsible for maintaining the confidentiality of your account and password and for restricting access to your computer to prevent unauthorised access to your account. 4.4 You should take all necessary steps to ensure that the password is kept confidential and secure and should inform us immediately if you have any reason to believe that your password has become known to anyone else, or if the password is being, or is likely to be, used in an unauthorised manner. 5.1 The content displayed on the review sections of the Website (if any) and any third party advertisements of the Website is provided or posted by third parties (“Third Party Content”). We are not the author of that content, whether contributed by contributors or paid content providers. Neither us nor any of our affiliates, directors, officers or employees has entered into any sales agency relationship with such third party by virtue of our display of the Third Party Content on the Website. Any third party content is the sole responsibility of the party who provided the content. We are not responsible for the accuracy, propriety, lawfulness or truthfulness of any third party content, and shall not be liable to you in connection with your reliance of such Third Party Content. 8.3.1 for death or personal injury resulting from negligence or on the part of Easycrane Ltd or its employees. 8.3.2 for any damage or liability incurred by you as a result of fraud or fraudulent misrepresentation on the part of Easycrane Ltd or its employees. 8.5 In any event, subject to condition 8.3 our total liability shall be limited to £100. 8.6 This clause 8 does not apply in relation to purchases made through our site. Our liability in respect of the goods and services supplied to you when you make a purchase through our site is dealt with under our Terms for Personal Customers (if you are a Personal Customer) and our Terms for Business Customers (if you are a Business). The governing law of these Terms and Conditions is English law and you hereby irrevocably submit to the non- exclusive jurisdiction of the Courts of England. This does not affect your statutory rights as a consumer to bring claims in your local jurisdiction. 12.2 If you are registered as a Business Customer or a Personal Customer we may email you with any changes to the Terms and Conditions.